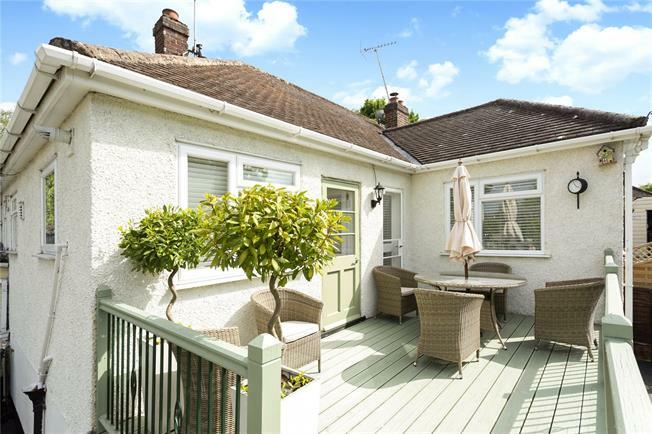 2 Bedroom Semi-Detached Bungalow For Sale in Brentwood for Asking Price £495,000. FEATURED IN THE BIG OPEN HOUSE - 27th and 28th April - call to arrange a Viewing Appointment! An attractive extended 2 bedroom semi-detached bungalow situated within St. Martins School catchment area. The property has spacious accommodation and bright, stylish interiors comprising: Entrance hallway, L shaped reception with rear access and a feature fireplace with a wood burner, fitted kitchen with access to the rear, 2 double bedrooms with fitted wardrobes and a family bathroom with a fitted vanity unit. Outside the rear landscaped garden has a raised decked terrace stepping down to a gravelled path which wraps around a lawn area bordered by sleepers with an array of shrubs and evergreens to the far rear for privacy. To the front the driveway is also adjoined by gardens and leads to the attached garage to provide off road parking.